Can you help us by donating your time? We always need charity shop volunteers that can offer regular assistance with general duties in our Wigan charity shop - just one half-day per week can really help. There are many ‘behind the scenes’ roles such as sorting, steaming, cleaning and polishing that are vital to the successful running of both shops as well as ‘front-facing’ display, sales and till work. We regularly hold collections at locations across our branch area - in town centres and in stores such as ASDA, Pets at Home and Tesco and these are an important source of income for us. We always need collectors to help shake those collection boxes. Usually, you will only be asked to collect for one to two hours and you will have a partner collector - and you can take your people-friendly dog with you if you want. We love it when people come up with ideas for events and activities that they will do themselves either as an individual or as a group to raise money for our branch (e.g. sponsored bike ride or parachute jump, a local coffee morning or bigger event). Have a look at the get fundraising page on the national website for more ideas! Whatever you are planning, especially if it is an unusual activity, it may be worth getting newspaper or other media coverage. We may be able to help you with that if you contact us well in advance of your event. If you would like to raise money through a sponsored activity, we can provide a sponsorship form for you. Static collecting boxes within a community (placed in shops and pubs or any area accessible to the general public) can really help people understand the work we do to improve local animal welfare and gain us a regular and reliable source of income. Could you look after a round of between 6 and 10 boxes in your local area, servicing them regularly (approx once a month)? We will train you on how to record the monies collected and ensure that the funds get to the branch. You would be important to us as you will build good relationships with the owners/managers of the site where the boxes are placed which could lead to other fundraising opportunities (for example, we might become the beneficiary of the proceeds of a pub quiz night due to the relationship that started with the placement of a collection box). 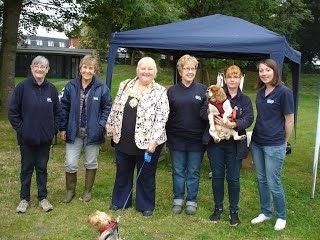 Adoption Support Volunteers are an essential part of our animal rehoming and adoption system. They visit the homes of potential adopters to ensure that that every animal goes to a good and suitable home, talk through the requirements of the animal and ensure that the accommodation, exercise area and containment are adequate. This is an interesting volunteering role but only suitable if you have regular time to spare, access to a telephone and the use of a vehicle. Before undertaking any home visits, you will attend a ‘home visiting’ training course which will help prepare you for the role. Become a member of the National RSPCA and you also become a member of your local branch with a proportion of your membership fee going to the branch. Once you are a member, you could put yourself forward as a potential Branch Trustee and actively help improve local animal welfare work across the whole of the branch area. Visit the national RSPCA site for more information about membership. If you are already a member and you are interested in becoming a Trustee, download the Trustee info sheet.